The future of Asia is in its cities. It is the cities and the activities generated therein that will help the continent march forward. But in order for cities to thrive, it needs people. Although still one of the less urbanised continents, Asia's urban population has grown from 32% in 1990 to 42% in 2010, according to the United Nations Population Division. By 2026, half of Asia's 3.7 billion population from India to China (excluding the Middle East) will be city dwellers. Are the cities prepared to receive the exodus? But let's not go too far. Is Kuala Lumpur ready to welcome the expected 7.2 million that will be calling Greater KL their home? And what is needed to make KL ready? By 2020, seven out of 10 Malaysians will be living in what will be known as Greater KL. If this is to materiaise, there is much work to be done. After all, that is just nine years away. Depending on who one speaks to, there are various issues that contribute to a city's livability. In a recent study commissioned by Siemens and performed by independent Economist Intelligence Unit (EIU), the Asian Green City Index examined eight categories, namely energy and carbon dioxide emission, land use and buildings, transport, waste, water, sanitation, air quality and environmental governance. The study, carried over the past few months, covered 22 cities. The cities were chosen independently, without invitations by the respective governments in order to enhance the Index's credibility and comparability. The study concluded that Singapore is Asia's greenest metropolis, ranked well above average. The study effectively equates being green with livability. Kuala Lumpur was ranked average, together with Bangkok, Beijing, Delhi, Guangzhou, Jakarta, Nanjing, Shanghai and Wuhan. Karachi in Pakistan, was ranked well below average while Ho Chi Minh in Vietnam was excluded for lack of available information. Barbara Kux, a member of the managing board of Siemens AG and the company's chief sustainability officer, says the index is not about choosing winners, but sharing information to enable cities to cope and to plan for their future. “The Asian Green City Index supports cities in their efforts to expand their infrastructures on a sustainable basis. We want to enable Asia's up-and-coming urban centres to achieve healthy growth rates coupled with a high quality of life. It is not about choosing winners,” said Kux. Siemens Malaysia Sdn Bhd president and CEO Prakash Chandran says, overall, the index is a good reflection of where KL stands in terms of its sustainability. “Ranking average overall is a great start for KL and this index is a stepping stone for us to move forward to improve our city's livability factor,” he says. “With the current government plans and greater awareness, the index could not have come in a timelier manner. Siemens is eager to be part of national initiatives to boost KL's performance for the future. Ultimately, we want to be involved in the transformation of KL into one of the greenest, most liveable cities in Asia,” says Prakash. Kuala Lumpur ranks above average for air quality and transport. It also scored well for better-than-average levels of sulphur dioxide, nitrogen dioxide and suspended particulate matter. It lagged behind in waste and water management. Head of research of Asian Green City Index and senior consultant for EIU, Jan Friederich, says Kuala Lumpur was given the thumbs up for transport because of its light rail system which measures 0.27km per sq km, making it the fourth longest superior network in the index, and second longest among cities in the mid-income range (GDP per capita of US$10,000-US$25,000). He based it on the length of the track, not usage. 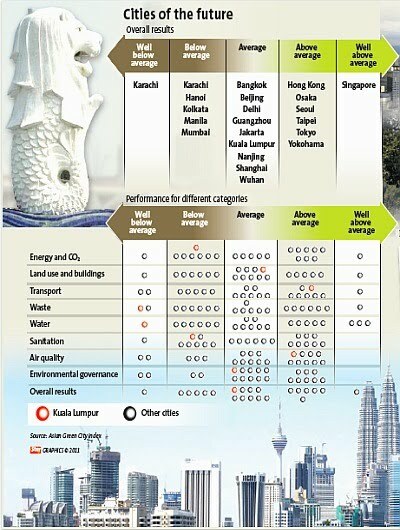 While KL ranked positively in transport, there were negatives in the area of waste and water management. Friederich says there is a high usage of convenience packaging and low waste collection rate. It also does not seem to have strong policies on reusing and recycling, he says. Waste generation is 816kg per capita last year, more than double the index average of 375kg. Water management was another negative. Water consumption is also high and Kuala Lumpur has one of the highest leakage rates with burst pipes, with leakages estimated at 37% compared with the index average of 22%, says Friederich. So how prepared is KL to count among the cities of tomorrow? NOTE: The European Green City Index was launched in 2009. Last year, Siemens unveiled the Latin American Green Index.